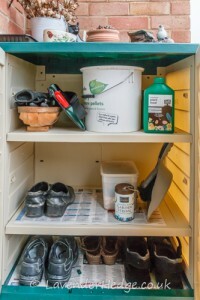 We seem to accumulate all sorts of ‘essentials’ by the back door; garden shoes, secateurs, gardening gloves, garden string, dustpan and brush, pots, watering cans, plant food etc, all of which I use too frequently to hide away in the shed! Until now these items have resided on some tatty old wooden shelves we’ve had for years. On the top shelf, I even have a ‘nature table’ reminiscent of school days, where I display dried seed heads from the garden, along with pine cones, conkers, pebbles and shells I have collected on my travels. 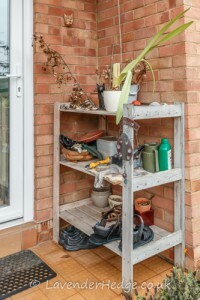 Although these shelves are just the right size to fit in the porch, everything ends up looking rather untidy and, when it rains, things get wet! Searching online I found a variety of different sized garden cupboards by manufacturers such at Keter, BillyOh, Rowlinson and Starplast, all of similar design. Eventually I found one whose dimensions fitted the space available and came with two adjustable shelves and a flat top. Whilst a sloping top might be better at repelling the rain, I choose one with a flat top so that I could use the top as a shelf for my decorative items. I was impressed by the speed of delivery by the Garden Store Direct. 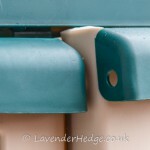 The Under-gardener volunteered to assemble the cabinet and found the instructions were easy to understand and helpful. It was claimed that no tools were required, but a sharp knife was needed to cut away bits of excess plastic in order to insert the fittings and a rubber mallet was needed to force fittings into place. Overall though, it was a relatively easy build of under an hour. This is not intended to be a thief-proof cabinet as it is only constructed of plastic, but you can padlock the doors together, which would be useful if you have small children around and you want to store chemicals or tools in the cupboard. 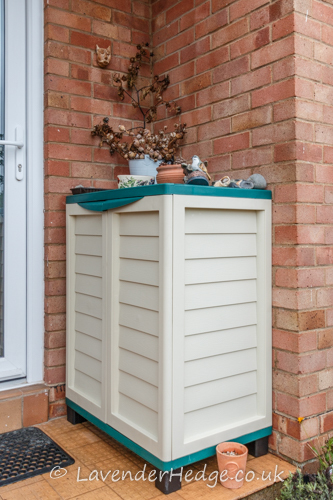 Due to the construction of the cabinet, I would not expect it to be totally weatherproof when left outside, but in a sheltered spot – for example under canopy or in a porch or garage – it does keep the contents dry and tidy. This cupboard is ideal for those garden essentials and household things you don’t want in the house – like your food waste caddy! This Compact Utility Garden Cabinet can be purchased here. Anyone who thinks gardening begins in the spring and ends in the fall is missing the best part of the whole year; for gardening begins in January with the dream.